As sisters and brothers, we challenge the injustice of oppressive systems and spend ourselves to empower the disadvantaged. 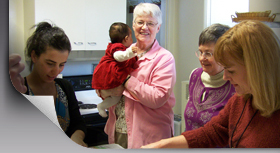 The Sisters of the Presentation have made a concerted effort to extend hospitality to all women and children whose needs are greater than they ever anticipated, and whose very lives depend on our empathy and our service to them. We commit ourselves to empowering women and children in every ministry that we serve. Through various active ministries we seek to lessen whatever dominates those who are enslaved by poverty, lack of other resources, assaults on their dignity or actual danger to their persons. Our desire is, through warm hospitality and concrete assistance, both material, spiritual and emotional, to restore their dignity and to help them begin again. Our everyday actions speak to our commitment to women and children.